In the footsteps of Joseph Rock 重走洛克路: New map source for China - "Map World"
New map source for China - "Map World"
I've written here before about how useful Google Earth is when planning trips to remote parts of China where there are few/no good topo maps available. The fly through 3D terrain feature was especially helpful on our last trip to Yading, giving up a good 3D awareness of where we should be going. One of the main limitations of Google Earth and Google Maps in China is that much of he satellite mapping is low resolution, and of limitd help when you want to get close up. 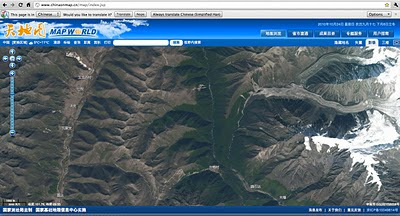 Now the Chinese government have produced a rival to Google maps - called Map World - chinaonmap.cn. It's a bit slow and clunky, but they do have some slightly higher definition maps available. However, they stil don't have as much detail as Google Maps in many areas. I've yet to work out how to get the terrain feature working - it says I need to be using Internet Explorer 7 or 8 - not easy when I'm using a Mac. It's also only in Chinese at the moment. 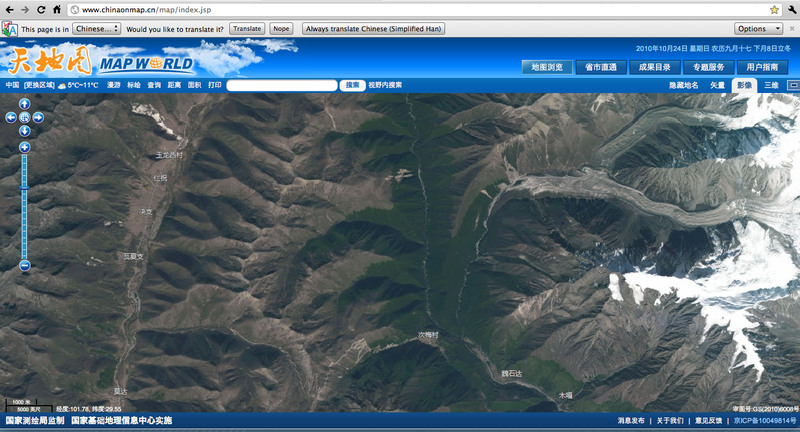 Anyway - here's a sample of the map showing the route over to Gonga Shan from Yulongxi. You can see the new track that has been put in - look carefully and you can also see the monastery at the side of the glacier. (Click on the map image to see larger). Thanks for this link, Michael. This is a really useful map site. I doubt I'd have found it otherwise.